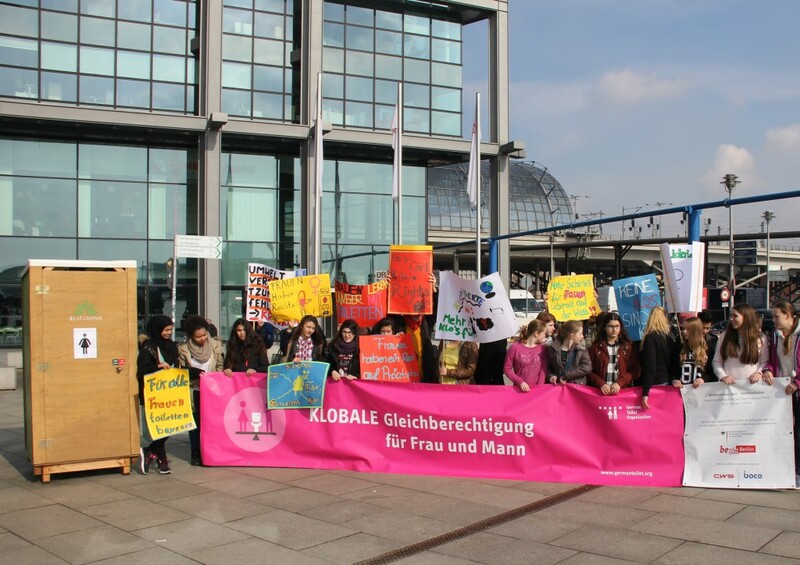 On the occasion of International Women’s Day, Berlin pupils and the German Toilet Organization (GTO) staged an unexpected scene at the Washington Square in front of Berlin Central Station. In the focus of the flash mob were two toilet stalls, one for women, one for men. With a disproportionately long queue in front of the ladies – a well-known image – the pupils called attention to the lack of equality between the sexes in front of the loo. According to the World Health Organization, one in three women worldwide have no access to safe and clean sanitation. In poor neighborhoods of urban areas the only existing public toilets are rarely gender-separated. More than 500 million women and girls therefore do their business outdoors. Many go only at night, in order to protect their privacy. This is not only unhealthy, but also makes them prone to harassment and sexual assaults. “Good sanitation is not only a key to development, but also to equal rights for women and girls,” says Thilo Panzerbieter, Executive Director of GTO. Especially in the field of education, access to an adequate school toilet plays a crucial role in school attendances. “About half of all girls in least developed countries attend schools with none or only very inadequate sanitation,” adds Panzerbieter. The lack of privacy and poor hygiene conditions lead to school dropouts as soon as the girls reach puberty. These problems can be greatly reduced by improving sanitation in schools. According to a study by UNICEF in Bangladesh improved school toilets led to an increase of 11% in girl attendances.